Salesforce.com helps businesses produce valuable business outcomes much faster than traditional enterprise alternatives such as Java or .NET. Part of this speed is due to the declarative nature of the platform, which is also known as force.com, by quickly creating a data model that does not require developer assistance. While a developer is not needed, it also may produce a situation where someone who does not understand how to design effective data models could potentially produce broken or ineffective solutions. I’ve been working with Salesforce.com on and off over the past two years with Xede, helping produce valuable business outcomes for non-profit, manufacturing, government, and health care companies. We have produced solutions from automating time consuming RFP processes, implementing customer service solutions (Service Cloud), full e-Commerce websites and more, all built on Salesforce.com. Back in April, I committed to become a Certified Force.com Developer and have been preparing to take the exam. This morning, the time came to take the exam, which I passed. 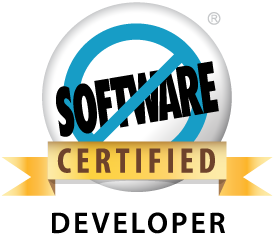 I am now a Salesforce.com Certified Force.com Developer. What do you think about certifications? Are they necessary? This entry was posted in Career, Salesforce.com. Bookmark the permalink. Congrats. Is this something that an experienced coder, with no knowledge of SFDC could learn online and then pass, without taking a paid-class? The short answer to your question is yes, you can learn this online. It will be challenging because this exam is very SFDC specific. This certification isn’t so much about “programming” in the typical sense of writing code. It is more about the underlying security model, data model choices, and when to use certain constructs within SFDC. I never took a paid class, I did my learning online and had worked on several SFDC projects which really helped. You can also find some developer training videos online as well as podcasts on iTunes.